The games will open next Wednesday, 4 April, with the customary address from Buckingham Palace read by Prince Charles. Clarence House has confirmed the Duchess of Cornwall will accompany him. The usual Republican noises will probably be heard, but Oz prime minister Malcolm Turnbell, while an advocate for a change of constitution, is known to be respectful towards the Queen and will steer clear of any controversy. The cricket fiasco will certainly be mentioned but somehow put aside. Officially, it is the Gold Coast 2018 Commonwealth Games, but for many it is “off to Brisbane”. The “Gold Coast Games” is what the locals want it to be remembered for. The athletics takes part in the stadium in a venue normally the home of the local Australian Rules football team. The capacity has been doubled temporarily to 35,000. Gold Coast Airport (OOL) is in fact the nearest air travel gateway, moving 6m passengers last year, Qantas and its affiliates the largest operator, with AirAsia X, Air New Zealand and Hong Kong Airlines giving worldwide connections. While the 11-day long extravaganza is definitely The “Gold Coast Games”, the venues stretch from Cairns, 1,000 miles to the north, through Townsville, Brisbane, and to what is surprisingly Australia’s sixth largest city with a population of 600,000. It is a major tourist destination with a sunny subtropical climate, wonderful beaches, many golf courses, a vigorous night life and a variety of restaurants. It is a very long way from London. (And 5.5hr from Perth – don’t try that route from Heathrow – you can fly direct via a number of quicker intermediary points). Enough of the Gold Coast. BTN has been previously many years ago and can vouch for its attractions. This time it was by ship, Norwegian Jewel, docking at Brisbane’s rather basic Grain Terminal, which is about 30min from the centre of town. Smaller cruise ships that can get under the Sir Leo Hielscher Bridges can use the purpose-built Portside facility just a 10min drive from the downtown area. Visitors for the day have an enormous choice of what to do. Frankly, you can’t begin to understand Brisbane in the 8hr stopover/port visit but it is a great opportunity to get a feel for the place. 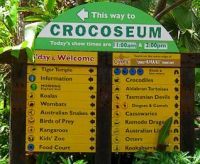 If you are thinking of Brisbane for a future visit (or for the Commonwealth Games), some of our fellow passengers reported on some successful visits including the Australia Zoo, home of the late crocodile hunter Steve Irwin and his family. The crocs were less than friendly, unlike the koala bears, and the kangaroos were just a hop away. Also enjoyed was the Gondwana Rainforest World Heritage site, with examples of subtropical and temperate major woodlands and cascading waterfalls. Some passengers it seems took a refreshing dip in the natural freshwater pools. For others, it was the boutique wineries of Mt Tamborine. Five stops and tastings of award-winning wines and a gourmet two-course winery lunch. We gather most participants slept on the way back! With us it was a taxi to the highly-recommended Cliffs Café at Kangaroo Point, a great vantage point overlooking the city and Brisbane River from the clifftop. From here, one could see the river ferries shuttling about, the free Cityhopper for the central area, CityCat for the suburbs, and a courtesy cross-river service in the centre. Next it was to King George Square to meet a Brisbane Greeter. 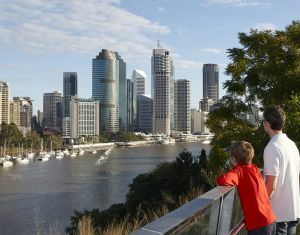 This is a free walking tour of the city organised by locals who love the place so much they want to give their free time in introducing Brisbane and sharing their intimate knowledge of their home town. The service was a recipient of the gold award at the 2017 Queensland Tourism Awards for outstanding contribution by a volunteer or volunteer group. Blair Allsopp, our guide, was so good that he was talent-spotted by a local TV station and now has a regular spot telling the viewing community all about their city. Our walking tour lasted about 2hr. It began outside the visitor information centre in Queen Street Mall and passed many of Brisbane's early colonial buildings and historical sites, sculptures, monuments and street art, all with their own stories to tell. At King George Square, your scribe was accosted by a TV reporter and cameraman writer who wanted to know just where in England I was from. It turned out he was from a rival station, with our host standing back discreetly. 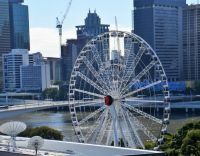 The Wheel of Brisbane across the river was the next point of call, not as large as the London Eye and you get three rotations, but impressive all the same, sitting by the river and with the South Bank Parklands just by, pretty foliage and a nice walkway. Then on to a catamaran, passing the famous Brisbane City Botanic Gardens, also riverside, completing our journey at the Eagle Street Pier. The colonnade that is the Anzac Memorial was the next point of call, and then to the railway station entrance and our coach back to the ship. A fine day out and a great taster. Brisbane deserves more time!